The HERO architecture sets a new precedent in optical gaming sensor design. It has been designed from the ground up to optimize performance and efficiency and sets the new standard for optical gaming sensors. In the history of gaming mouse sensor development, there have been many different iterations of a few core architectures, many designed with Logitech. Most sensors focus on either maximizing performance or maximizing efficiency as the two values are historically mutually exclusive. If you max out performance, it usually takes a lot more power, and if you max out efficiency you sacrifice performance. With HERO, Logitech has created an entirely new architecture and operating philosophy that delivers ultimate performance AND efficiency for the first time together. When looking at the performance of a gaming sensor, there are many metrics to consider. Below are some of the factors used to discuss the performance of a gaming sensor. Logitech G has minimum values set as a requirement for our gaming sensors. Accuracy: The ability to consistently deliver the same cursor distance traveled on screen, irrespective of the physical speed at which the mouse is moved between two points on the tracking surface. Terms like “1 to 1” or “raw input” are attempts to describe accuracy. Logitech G has a minimum requirement of 98% accuracy over the entire surface range for our gaming sensors. Max Speed: The maximum speed your mouse can physically be moved over the surface while still allowing the sensor to correlate and send accurate X/Y data. Typical metrics are Inches per Second (IPS) or Meters per Second (m/s). The target value is 300 IPS (7.62m/s) over the entire surface range. Smoothing: A filtering method embedded in the optical sensor or mouse firmware that averages multiple data counts together to eliminate, or smooth out, erroneous (or spurious) motion. This leads to smooth (ripple-free) tracking, but adds latency to cursor movement. It is because of this latency that smoothing is very bad for gaming. Our requirement is zero smoothing over the entire DPI range and Logitech G is the only company currently delivering on this promise. Ripple: Sometimes called jitter, this is a deviation between the sensor’s reported trajectory and the actual physical movement in an A to B mouse displacement. Ripple tends to scale up with dots per inch (DPI), and weaker sensor designs and firmware implementations often use smoothing to mask ripple. This value should be as close to 0 as possible; our requirement at Logitech G is <0.001 deviation. Some of the first gaming sensors used in Logitech G gaming mice, including the 3080 and 3090 used in MX500-MX518 and G400, were based on the original 2020 design made by Avago at the request of Logitech. Another popular sensor design was the 9500, which later became the 9800. The 9800 spawned a number of derivatives (including 3310 and 3988) that have been used in many different mice, and are still revered today. Rather than utilizing these derivatives and continuing to rely upon incremental upgrades to existing silicon, Logitech G has worked to push the boundaries of performance and efficiency to deliver noticeably better experiences. 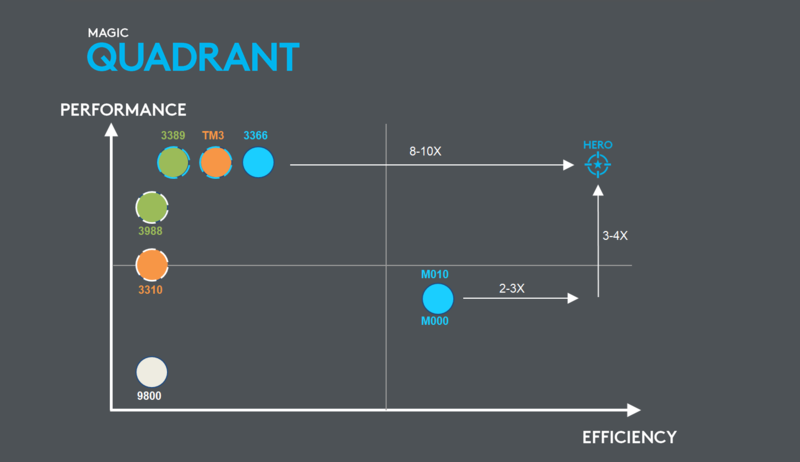 An early example of this work is the M010, which offered 5x more power efficiency compared to 9800-based mice. This allowed us to create the G602 wireless gaming mouse, with 250 hours of non-stop gaming on two AA batteries. We then placed focus back on performance, and designed the PMW3366 with sensor manufacturer Pixart. This sensor had unrivaled performance for his time and is twice as efficient as high performing 9800-based sensors before it. While the 336X sensor is now available to anyone who wants to purchase from Pixart, the firmware still needs to be designed to operate the chip. The firmware used by Logitech G with the 3366 is still the only implementation to achieve zero smoothing at ANY DPI with that sensor architecture. Other implementations introduce smoothing as early as 2k DPI. However, it was not possible to achieve the two different design goals of simultaneous power and efficiency without radically rethinking the architecture of the sensor as a whole. The HERO architecture is a ground up innovation to achieve maximum performance while extending power efficiency for the ultimate gaming sensor. Figure 1: The “Magic Quadrant” plots mutually exclusive values, achieving the best of both worlds. HERO provides ultimate performance and efficiency. 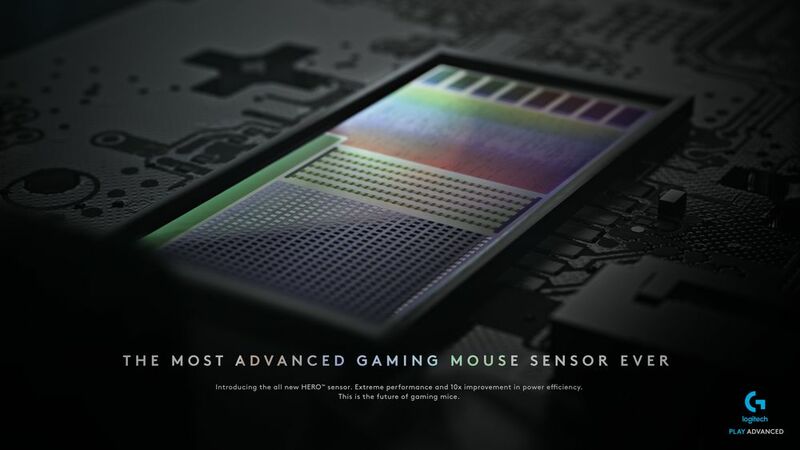 The HERO sensor has many unique attributes that make it to be the current pinnacle of optical gaming sensor design. HERO uses a continuous frame rate and tight voltage control system to enable extremely high flexibility and efficiency of processing. This allows the sensor to operate at the optimal frame rate for the users specific setting while constantly saving as much energy as possible. The entire design has been thoroughly optimized for maximum performance and low power consumption from the lens cluster all the way to how the sensor integrates with the MCU (Micro Control Unit) of the mouse. Figure 2: HERO sensor design is a combination of many optimizations and innovative chip designs. Together they create an incredibly high performing and highly efficient sensor system for gaming mice. 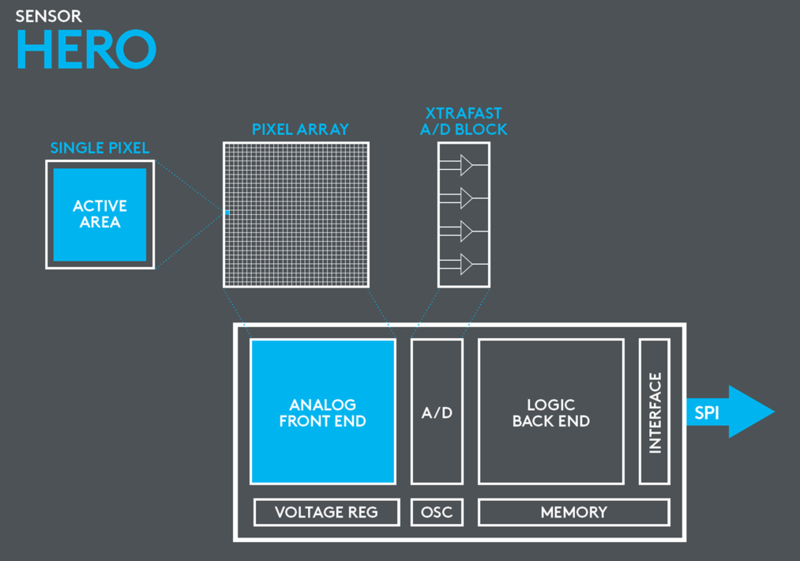 Overall, the HERO sensor architecture is made out of two major blocks. First and foremost is the pixel array and surround that is mainly analog circuitry, which is also called the “front-end”. This is the most important part of the whole sensor system, as what is lost at the input cannot be restored afterward. It is essential to start with a great capture of the tracking surface. Designing a very high quality and high performing front-end will result in not only a great basis for performance, but also allows other components to be upgraded in the future. If we dig more into HERO front-end, we see a matrix of pixels. This CMOS detector is responsible to collect light from the imaged surface through the lens system and convert photons into electrons. This may seem trivial but the quality of this operation is critical for sensor performance. The design of the individual pixel is crucial for the rest of the system to operate well. HERO utilizes a much higher active pixel area which reduces wasted energy consumption and also maximizes capture. Compared to previous generations of sensors, HERO can run at a much higher maximum frame rate. This provides more flexibility for different capture scenarios and physical movement speeds. The continuously variable frame rate is also crucial to enable ideal tracking for the specific usage scenario of the user. This is a huge benefit to tracking performance. A fixed frame rate if set high (>8,000 FPS) will improve acceleration and also reach higher speed, but it will penalize low speed accuracy as small movement will be hard to follow properly due to too high oversampling. A fixed frame rate if set low (<5,000 FPS) will improve low speed tracking but will fail as soon acceleration increases. It also has a lower max speed. A variable frame rate using fixed steps, (like 3366 and other gaming sensors) improves on fixed frame rate designs but is still hampered by a limited number of steps or “gears”. Most sampling strategies tend to lean towards oversampling to avoid missing movement data, but then run the risk of poor low speed accuracy. HERO uses a continuously variable frame rate which constantly adapts the sample rate to always be able to deliver maximum performance regardless the speed or acceleration. Another key differentiation with the new HERO architecture is how it handles different surface materials in regards to lift off distance (LOD) and LED operation. There are many factors for how this is processed but LED operation and technique is a huge component to how the final image is processed in relation to LOD. The goal is to have a very small and consistent range of LOD across a large number of different surfaces. Previous attempts to achieve this, like in PMW3366, have used surface tuning to specifically optimize for the current surface and tighten the range of LOD. Surface tuning improved the tracking performance over previous generations but also made it less ideal for the next surface if different from the first. HERO uses a much more intelligent LED system to continuously adjust the lighting power and intensity (frame by frame) to produce the optimal capture for each given frame regardless of surface. This means HERO automatically provides the smallest deviation and lowest LOD possible given the current tracking surface, resulting in a more predictable and consistent tracking experience. The second part of the sensor architecture is the logic block, which is responsible for processing the front end data, running the tracking algorithm, and finally communicating with the mouse MCU for data output to the host PC. This part of the sensor is commonly hard coded in the silicon of the sensor, but this makes it locked to that particular set of functional values. It is also possible to implement an SROM, or Shadow ROM, which imparts a modest amount of flexibility in modifying default parameters. HERO sensor instead uses a flash memory based firmware that permits adjustments, like changing the core algorithm, allowing much wider possible tracking improvement options. This means HERO is updatable and adaptable to future optimizations and use cases. This is, in part, how evolutions were able to be made to create HERO 16K. A third component is the A/D converter, which takes the analog input data from the front end and turns it into 1’s and 0’s for the logic block to process. HERO uses a special A/D process which uses much faster and low power operating circuits (cleverly named XTRAFAST). Having a fast conversion system permits to save power in between conversion cycles, even when operating at higher frame rates. The result is drastically reduced energy consumption. Aside from these three main components, there are several peripheral blocks. Variable Voltage Regulators handle specific power to each block ensuring nothing is wasted. Oscillators feature three different master clocks in order to operate each block at its best efficiency point. All displacement calculations are run on the sensor die itself, which enables it to operate with zero smoothing or filtering in either the sensor or in the mouse MCU. This is a crucially important distinction between Logitech G sensors and other implementations: the promise of never introducing smoothing or acceleration throughout the entire DPI range. The mouse MCU simply packages X and Y sensor data and sends it raw to the USB bus which then sends the data to the PC at a cadence of 1000 times per second (1ms). The HERO architecture represents the new standard for performance and efficiency in optical gaming sensors. It not only supplies the most accurate and highest performing tracking by any sensor design to date, but does so at up to 10x better efficiency than previous generations. HERO can improve the experience of any kind of mouse and any kind of usage due to the capability to adapt and always provide best suited settings.